A group of math and science teachers watched as CPS Energy interns Adam Bolin and Thuria Abdelaziz used a three-step equation to calculate the costs of an energy bill. Bolin presented a chart of appliances with their wattages from which the teachers selected two to plug into the equation – a clothes dryer and central air conditioning system. Interns tallied up the monthly cost of kilowatt hours and within a few minutes, they had their answer – $154 to run both appliances for a month. “And that’s just the dryer and AC,” said Bolin. “It can really add up during the summer months. Most of the cost comes from cooling a home.” Bolin went on to remind teachers to check out rebates and programs on cpsenergy.com to find ways to save. Bolin and Abdelaziz provided an encouraging example for 16 local teachers taking part of an externship that we hosted last week. The teachers signed up for the externship through the Alamo STEM Workforce Coalition, a new program launched this summer to help teachers steer high school and middle school students toward career fields in science, technology, engineering and math (STEM). Interns give teachers a solar demonstration that can be used in the classroom. The externship also included a power generation presentation, a discussion about CPS Energy careers and a tour of the work area where employees test residential smart meters. 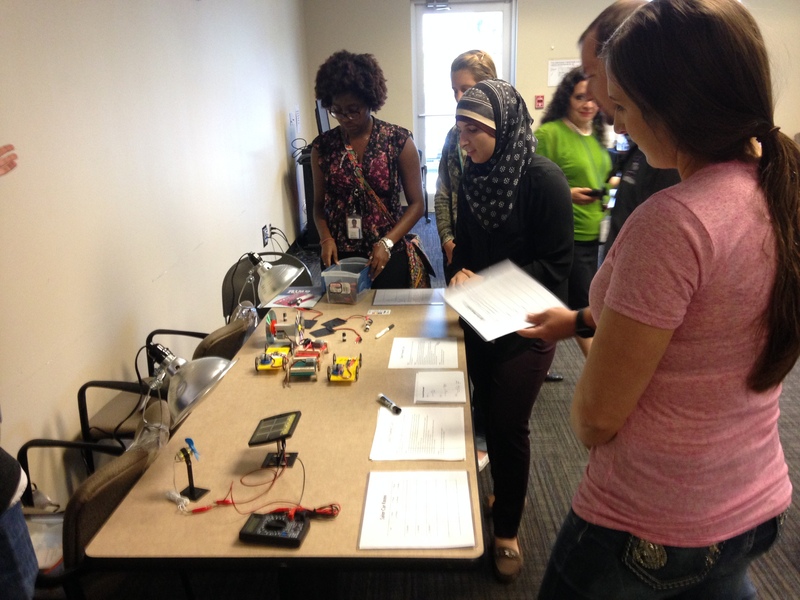 Teachers also received a new STEM-based curriculum related to our Smart Grid Initiative. The curriculum includes hands-on activities that interns introduced to the teachers. Interns also shared about their real-world experiences with our company. Cristina Duarte, communications specialist with our Corporate Responsibility team, helped organize the event and was proud to see the interns represent CPS Energy well. Duarte said she hopes the investment being made with these interns will result in them seeking future employment with CPS Energy.